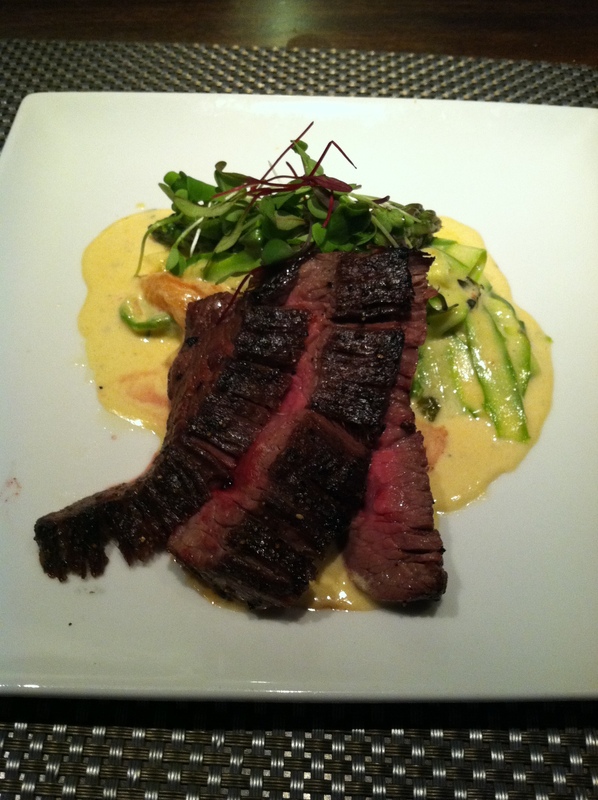 Zink American Kitchen is a fabulous restaurant here in Charlotte, NC. They have a menu feature called “Feed Me Chef” which I thoroughly enjoy. 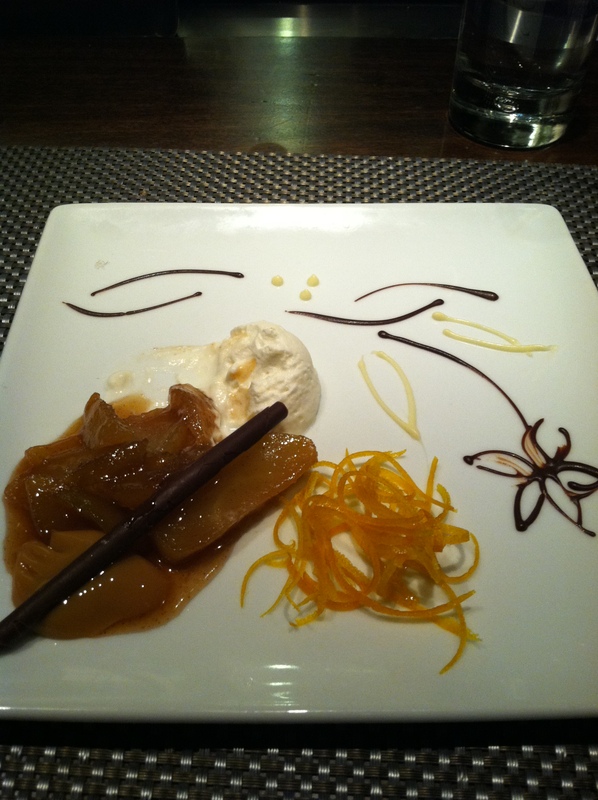 The premise is to tell them what you like, don’t like or have allergies to so they can create a 5-course menu for you. Our chef for the evening was Chef “DJ” Donald Ivey, Jr a graduate of Johnson & Wales University. He has been recently promoted to a sous chef position at Zink and if what I ate last night is any indication of what he can do, he has a bright future in front of him for sure. Settling in for Feed Me Chef! 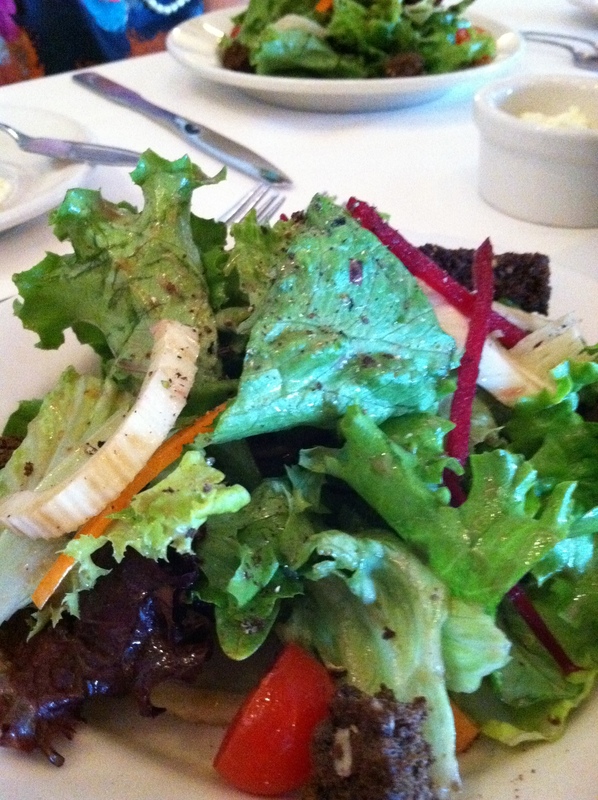 Our First Course was a salad from “Rosemary Pete” a local vegetable and herb grower. Something really nice about Zink is that they know who is growing their vegetables and source locally as much as they can. Rosemary Pete got his name by selling rosemary at local farmers markets. I must say the vegetables were spectacular. DJ pointed out each vegetable he used on each plate. You can tell he was as proud of those vegetables as he was the beautiful proteins he served us. We indulged in exotic radishes, turnips marinated in Prosecco and vanilla; bok choy and garnet potatoes. The small touches like preserved lemons, micro greens and smooth as silk peanut fondue and fresh crisp house made caramel corn really put the meal in high gourmet category. Most plates went back clean, what was left we brought home. After a while your stomach just gets full and rather than forgo any courses, a nice taste and then eat the rest later. I just finished the last of my lamb course a few minutes ago and the flavor and aroma’s brought back the entertainment of watching the cooks working back and forth; paying precise attention to every task, sliding across the floor and working in tandem with each other. I love watching a kitchen at work. I suppose that might be because I did it for so many years and I recognize the value of a well orchestrated team. option, he had a salad and their award-winning White Turkey Chili and a house salad. What a suburb experience! Every morsel was full of flavor, complementing textures and extremely high quality in every detail. (704) 909-5500 is the number to call for reservations or use Open Table. However, you will need to talk to the staff to arrange your unique menu. 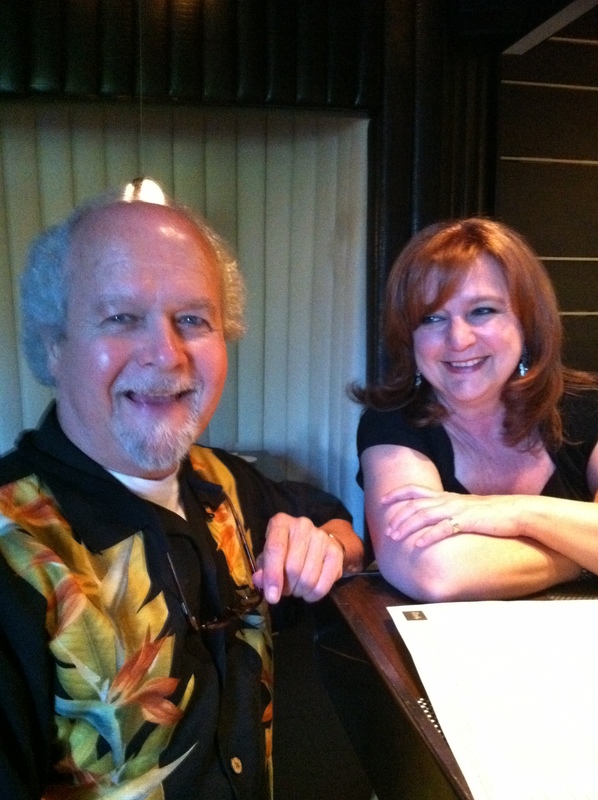 We have had Chef Amy Kumpf and Chef DJ Ivey create some amazing meals, I suggest you experience it too, soon. Our dear friend June had a mile marker birthday recently. 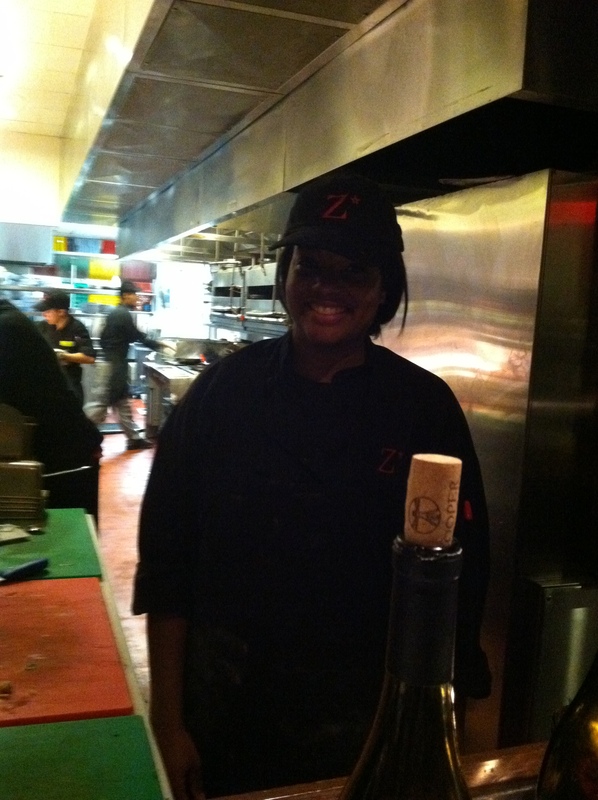 Our gift to her was to go out to the “Feed Me Chef” dinner at Zink American Kitchen in Charlotte, NC. What a wonderful experience! 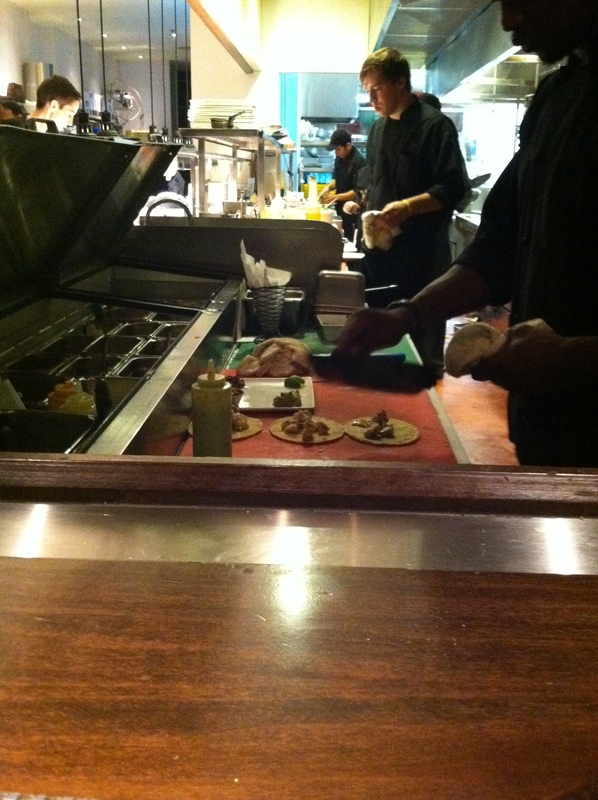 The premise of the Feed Me Chef dinner is to sit around the bar area that is right up to and nearly in the kitchen. The chef will then create a 5 course meal for you of their choosing. Sitting there, you get a birds-eye view of the kitchen operations from gearing up, getting slammed with the dinner rush and then slowing down slightly as we left 2 hours later. The hostess had called earlier in the day to ask about allergies, diet restrictions and if there was anything in particular we wanted. These parameters were given to Chef Amy who in turn gets to be creative and create a 5 course meal. The kitchen crew operated very well together. There was clear communication, effective movements and great looking food. Everyone knew their job and did it well. It was great entertainment. And you want to know something? In this open kitchen all the crew, both front and back of the house, were so polite not only to the guests, but most important, to each other. “Please, thank you, you’re welcome, excuse me”, all used frequently amongst the staff even when they were at their slammed best. How refreshing. 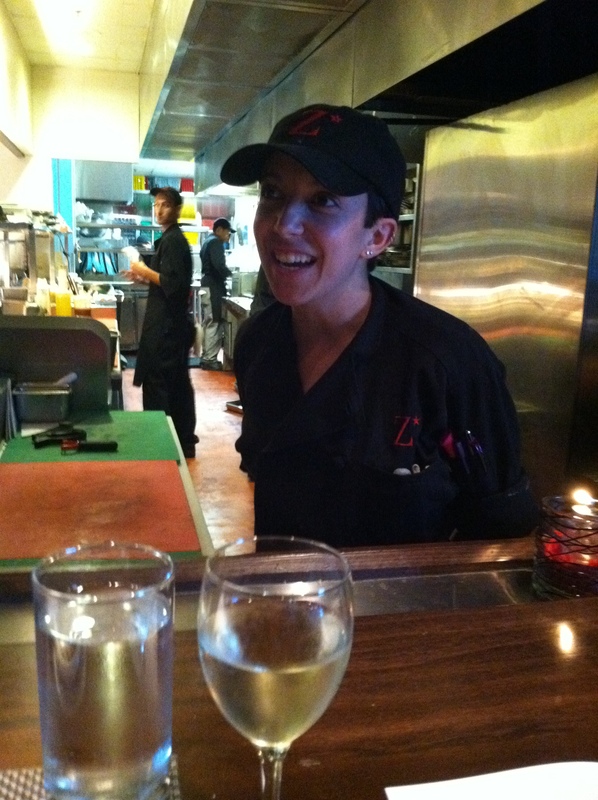 Our chef this evening was Amy Kumpf who was delightful, fun, charming, very skilled and knowledgeable in her craft. If was a lot of fun to watch her and her crew work through the dinner rush, very smooth. She planned a menu for us and paired the wine for each course. Settling in, our meal began. Instead of using fresh basil, Amy fried the basil for the salad. The result was delicate umami touched with sweet tomato that danced around in your mouth with a party going on. Amy reduced balsamic vinegar to a coating glaze which she drizzled over the assembled salad. 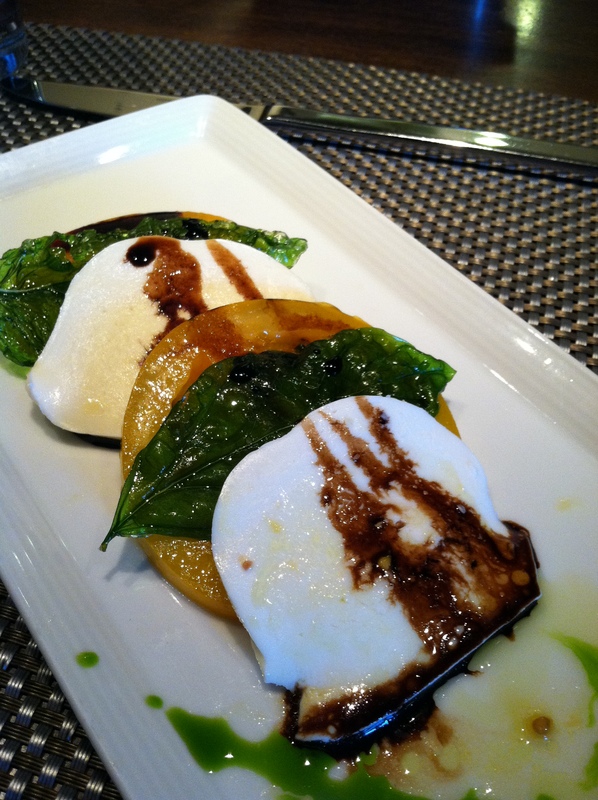 She chose yellow tomatoes, delicious fresh mozzarella, fried basil and balsamic reduction. Definitely whetted the appetite. It was beautiful and delicious. 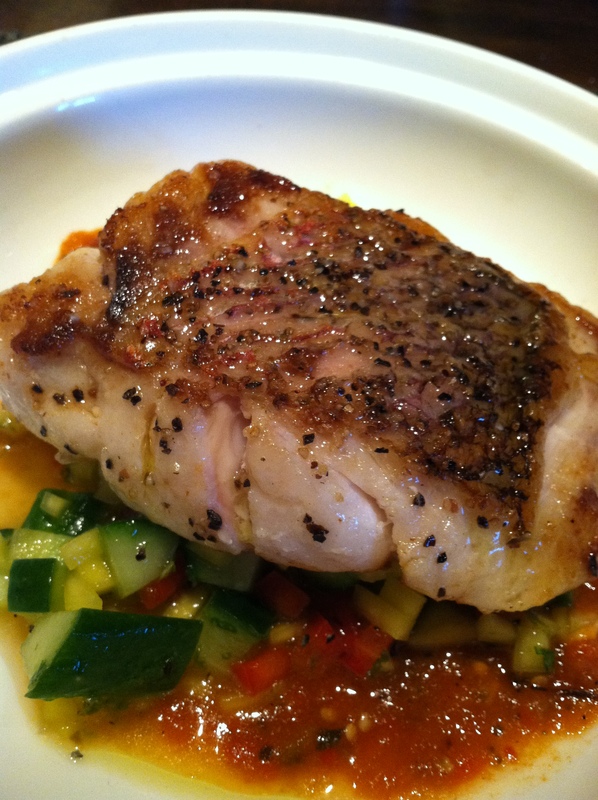 To pair wine with this course, Amy chose Cooper Mountain Pinot Grigio from Willamette Vally. This dish alone would be worthy to come back for again and again. Fabulous! The cucumber salsa had mango, red peppers, mint, honey and other things. It was very well made, knife skills showed. Fire roasted tomatoes are roasted and grilled with red peppers and blended to create a lovely sauce they use on several dishes from pizza to our snapper. 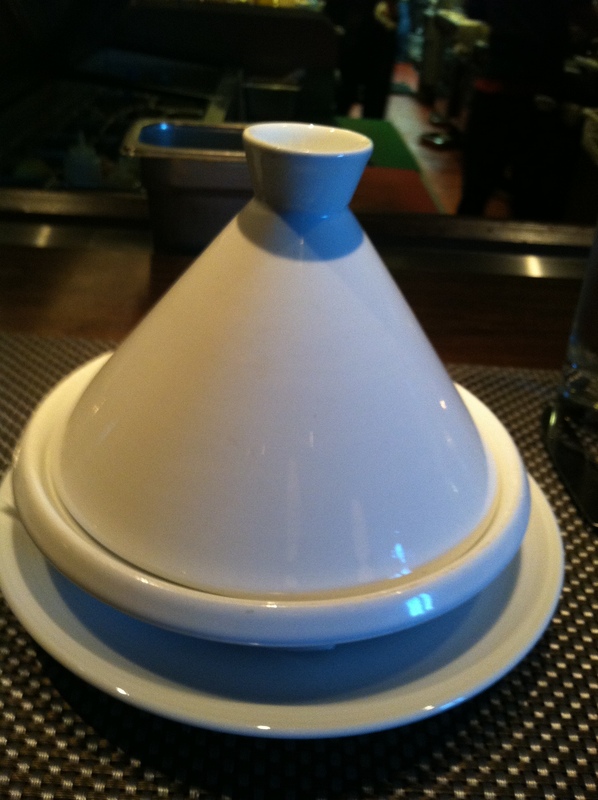 This was served in crisp white Moroccan style tangine. Wine paring: Chamisal Vineyards 2011 Central Coast Stainless Chardonnay (unoaked) Crisp and perfect with the complex flavors of this dish. Another genius dish. The potatoes went so well with the salmon, sweet 100 tomatoes are slow roasted to add a sweet acid punch to the richness of the potatoes and salmon. Additionally on the plate were fennel confit and melted leeks. Eating this was a pure pleasure experience. Wine pairing: For some odd reason I didn’t record the Pinot noir chosen for this dish. It was the only one we thought didn’t complement the food. We enjoyed the wine tremendously, just didn’t like the paring. Perhaps another Pinot with a fruitier base as most US Pinots are known. This one was in the “Burgundian” style which made it rich and robust with full tannins. These rich robust wines are normally my preference. But not with this dish. 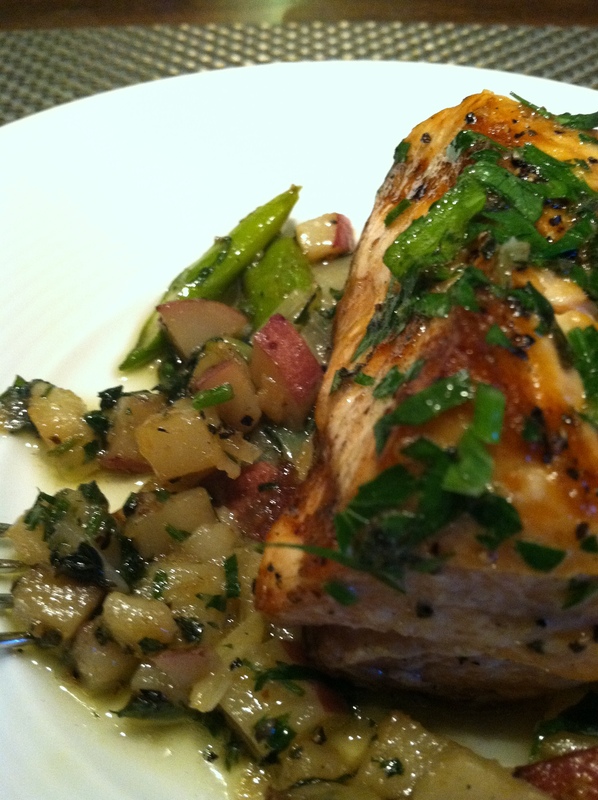 The sweet salty nature of the salmon and the delicate texture of the fish wanted something a bit milder. Seasoned and grilled to perfection. The meat was tender, juicy and full of flavor. Shaved asparagus was created by peeling asparagus length wise with a “Y” peeler. You can do a lot with a vegetable and a Y peeler. Here, Amy created ‘pasta’ for us with thin shavings of asparagus. By this time we were getting full. So I tasted everything and then decided to bring the rest of this dish home to eat for lunch and jump into dessert. Although our tummies were full, we managed to consume every bite. All in all, we had a great meal and an outstanding evening. I could eat like that every time we go out. The idea of not knowing what your next course will be is intriguing. We will have to do this again soon and I suggest you go find a place near you who does this kind of service. Ask at your favorite restaurant. Sometimes this style of dining is called a “Chef’s Table” and sometimes tables are in the kitchen. Depends on what the health code is in your area. You may discover such tables need to be reserved well in advance. We had a delightful interaction with the staff. The entire evening was great fun. These photos were taken in low-light conditions of the restaurant with the i-phone 4. I had to fast yesterday due to the annual physical. The appointment was at 2 PM so fasting from 6AM until then was for the most part, pretty easy. I did drink a cup of coffee with agave and half and half, only one, and then drank water the rest of the day. The hardest part of fasting was doing lesson plans, reviewing recipes, and writing lecture notes all about food and not being able to have any. So when the coast was clear after the physical, my friend June and I decided to go out to a restaurant we had never been to before. 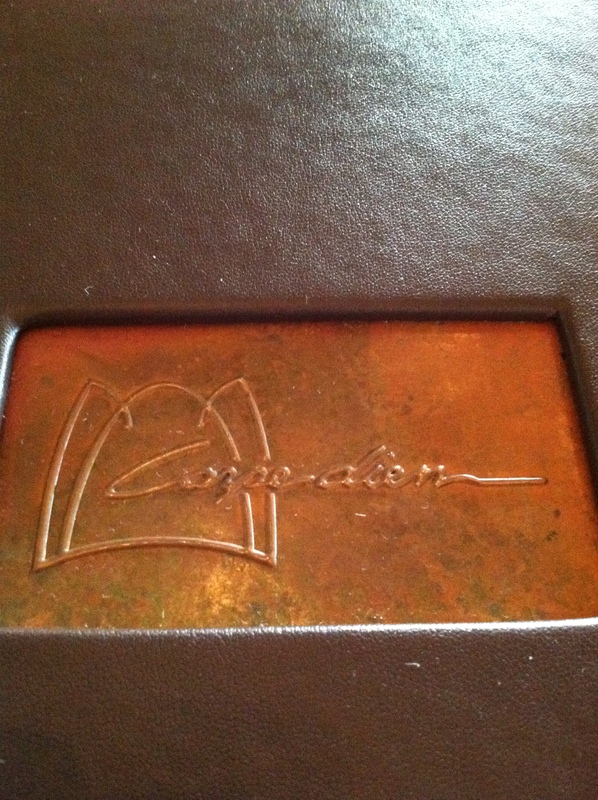 We chose Carpe Diem in the Elizabeth area of Charlotte. While passing the restaurant nearly every day, I had never been in to eat. I met some friends there once for a glass of wine and actually it is surprising how long it took me to get back to try the food. Carpe Diem is quite charming. The decor is art nouveau style with mahogany doors and window frames, pristine marble floors and copper lighting features. The staff is knowledgeable, friendly, enthusiastic and are well trained professionals. The restaurant itself is clean, charming, well located and the food is downright outrageously good. We each ordered a glass of wine, the water glasses were kept full, and even though we came in at 5 PM (I was starving!) we weren’t the only early birds there. The Elizabeth neighborhood actually had lots of people strolling, walking through various shops, eating ice cream from Elizabeth Creamery (another post… also well worth blowing your diet for), it was all very engaging. Fresh warm ciabatta bread was brought to the table. Crispy, chewy, if only the butter had been softer. Perhaps it would have been had we come later. I have often wondered why restaurants serve cold, hard butter with delicate warm bread. Isn’t it easy enough to remove the butter from the refrigerator about 1/2 hour before it goes to the table? We did get a second piece and by that time the butter was soft and perfect. We shared a house salad with Dijon Balsamic dressing. I knew I wouldn’t eat the whole thing and an entree too so June and I split the salad. Paige, our server, was great in that she had the split done in the kitchen. As you can see, even the split is a generous portion. The tender greens were accented with a surprise of shaved fennel, sweet grape tomatoes, crisp cucumber, carrots, and beets lightly and perfectly dressed in the vinaigrette. 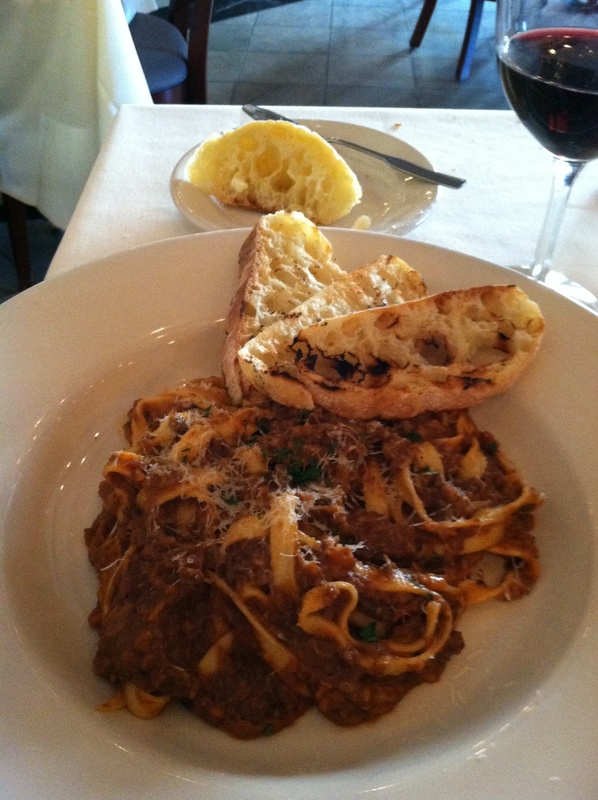 Our entrees were the Mushroom Bolognese over Tagliatelle Pasta. This is a vegetarian dish. Traditional bolognese sauce is made using diced wild mushrooms instead of meat. The pasta is hand made, cooked al-dente and more delicious than I can ever describe. On the side of the dish were three crispy slices of grilled bread. The smokey grilled flavor only deepened the richness of the mushrooms and tomatoes. Absolutely wonderful with the Malbec chosen to drink with the rich, deep comforting flavors. 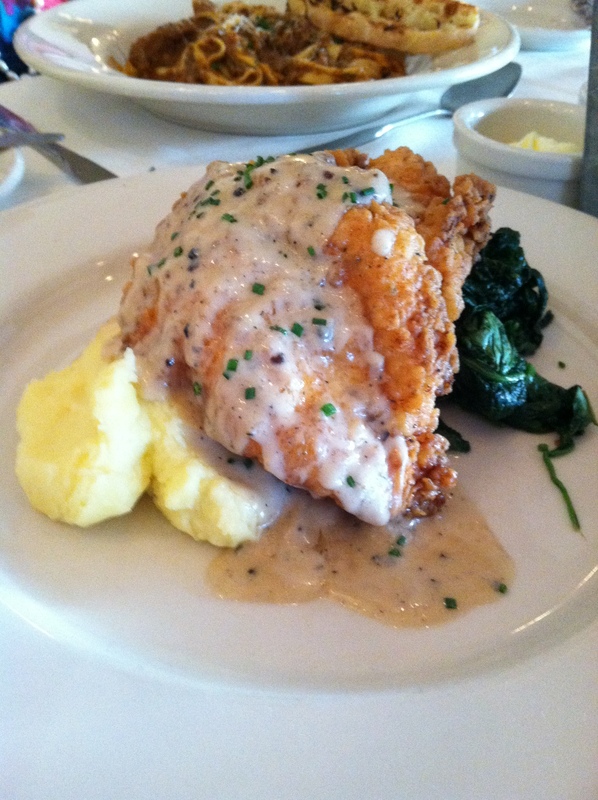 Buttermilk Fried Chicken Breasts with Shallot Black Pepper Cream, Mashed Potatoes and Sauteed Spinach was the second dish we ordered. Talk about comfort food! Just reading it on the menu made me feel like sitting on mom’s lap helping shell peas on the porch. Two golden brown, crispy on the outside, juicy on the inside, chicken breasts set on top of a bed of fluffy mashed potatoes, nestled next to brightly green sauteed baby spinach. This dish was also very well done and satisfied every taste receptor known to humankind. The potatoes were creamy, light and fluffy and actually tasted like potatoes; the spinach freshly cooked, tender and not a stem in sight. Taking a fork of each separately, tasting the flavors of each single item, then filling the fork with every combination of the creamy, crispy goodness for each bite allows the diner to experience the dish from many angles. From simple to complex, your taste-buds will be delighted in the play time they get from eating this dish. Believe me when I say buttermilk does magic things to chicken. Dessert temptations were vast, from white chocolate pound cake with lemon curd and fresh berries, peach and cherry cobbler, vanilla bean creme brulee to chocolate ganache in a toasted pecan crust with raspberry coulis and spicy caramel sauce. We couldn’t resist the chocolate and ordered two more half glasses of wine. Carpe Diem has half glasses of wine! 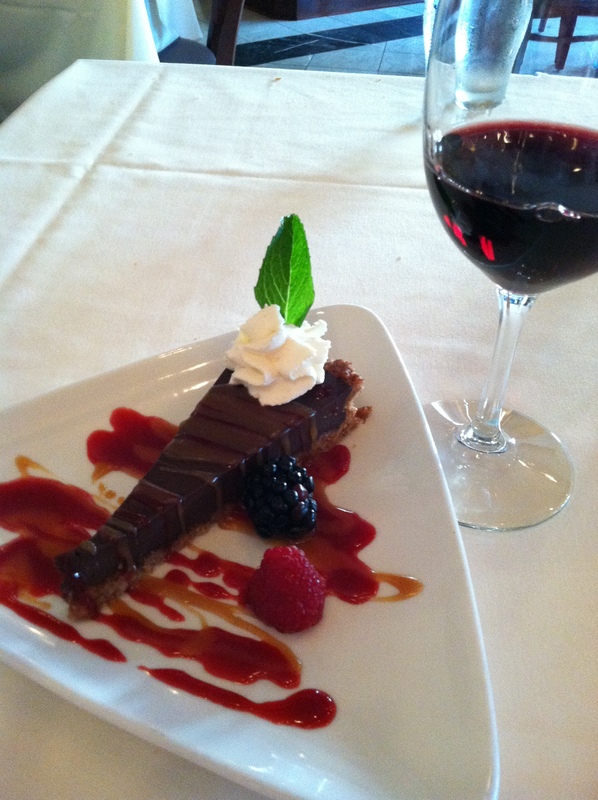 You must have red wine with chocolate like this. Rich, smooth dark chocolate, crunchy toasted pecans, the counter of the slight bitter-sweetness of the raspberries takes your tongue on another journey that makes your eyes roll back in your head. 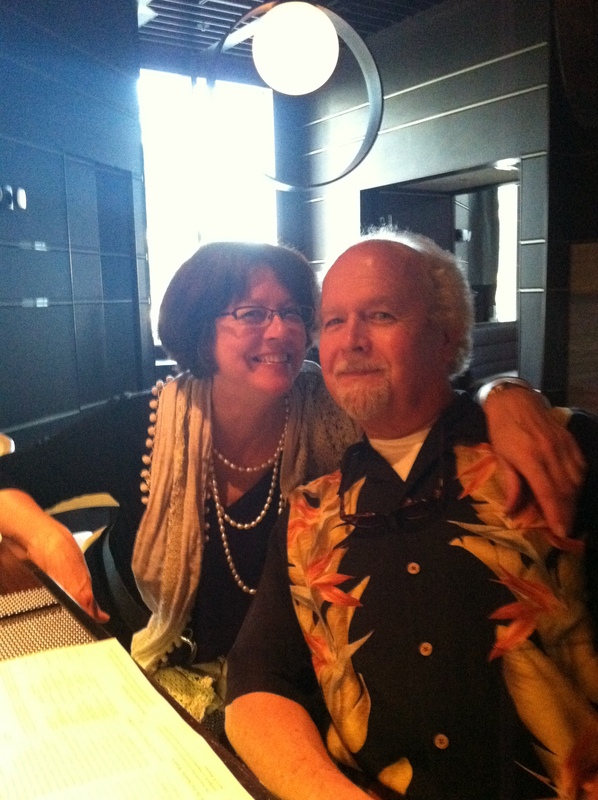 We started out wanting to just go get something to eat but ended up with a wonderful, amazing culinary adventure at a terrific restaurant on 1535 Elizabeth Avenue in Charlotte, North Carolina. The menu features several vegetarian options, fish, poultry (chicken and duck) and beef items on the menu. Each and every one sound very good. It was hard to choose which is a good thing since it means I will be back, and soon. If you want a light snack or linger over wine in the lounge, they offer appetizers, salads, lighter fare and a cheese platter which I was tempted to order just because I wanted to see it. Sometime soon, I’ll find a reason to meet some people in the bar for a glass of wine and share that cheese platter. It sounds too good to wait very long. The prices are quite reasonable so don’t let the fine dining appearance keep you away. If you like food, you owe it to yourself to get there sometime real soon. Carpe Diem, simply stated, GO! Don’t miss it. 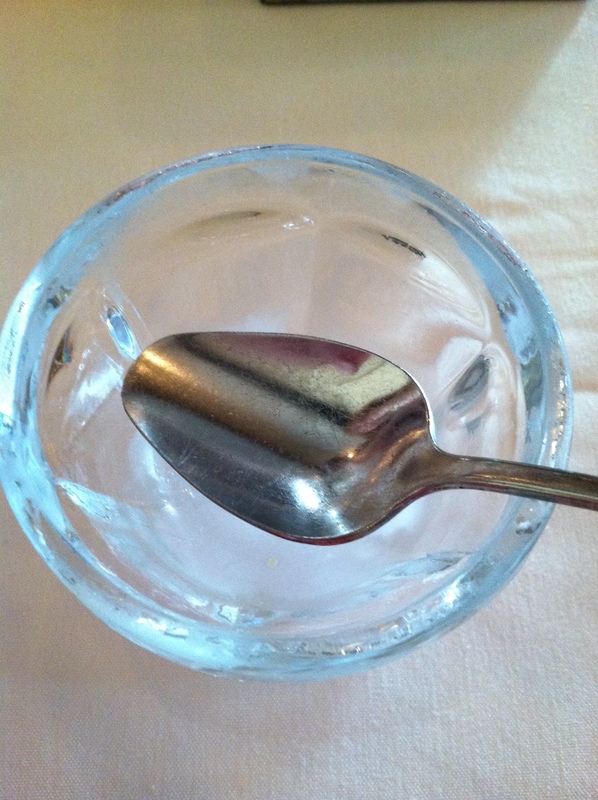 I almost forgot, between courses we were treated to an amuse bouche of passion fruit sorbet. Served in a frozen glass dish as a palette cleanser (this will be discussed another time), the flavor exploded in your mouth. It was so good I forgot to take a picture of it.